The Tahoe City golf course will celebrate it centennial with 50-cent green fees from Friday, May 11 through Sunday. A player lines up a putt during the early days of the course. 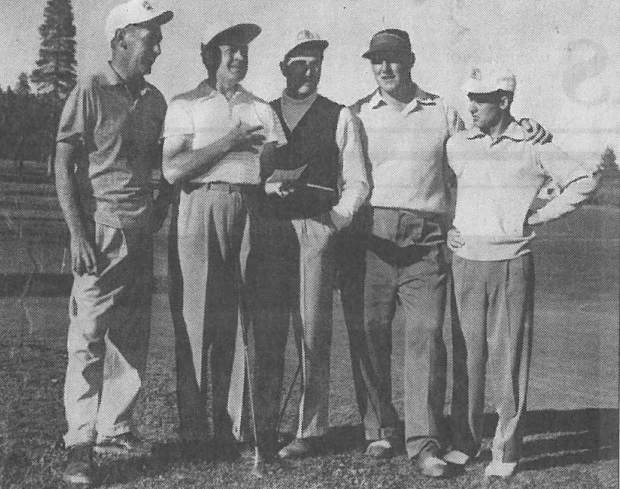 (From left to right) Former Tahoe City Golf Course owner Carl Bechdolt Jr. poses with Bob Hope, Charlie Reznick, and George Bayer, and an unidentified man. A player winds up for a shot during at Tahoe City Golf Course. 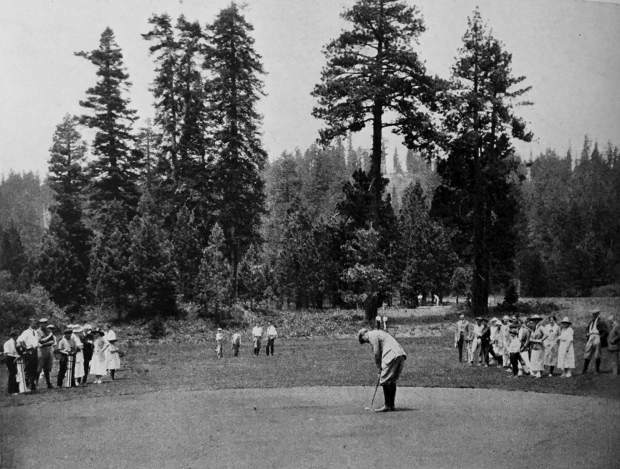 Tahoe City Golf Course was opened in 1918. 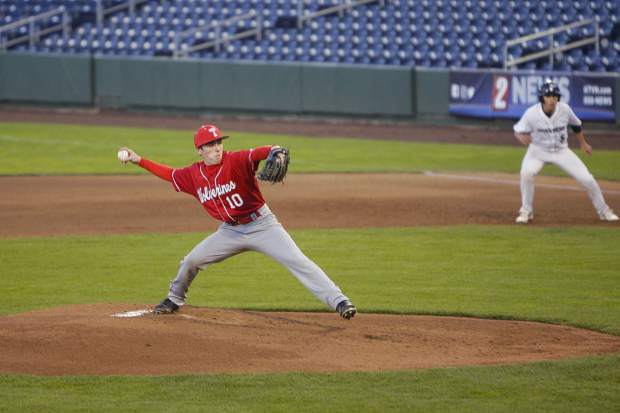 The course will begin centennial celebrations this weekend. 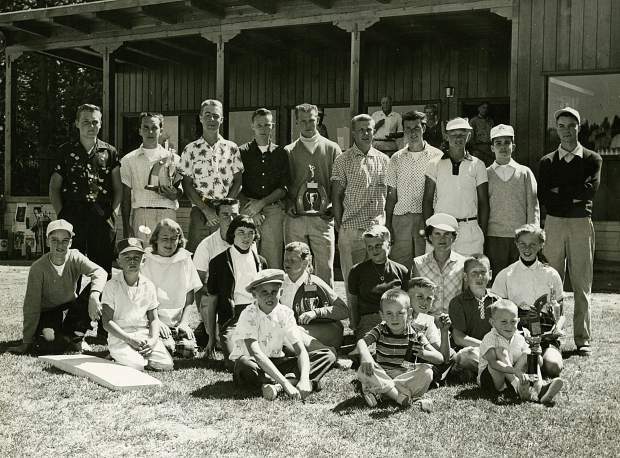 Youngsters pose in front of the clubhouse at Tahoe City Golf Club. Stepping onto the first tee box at Tahoe City Golf Course is like traveling back in time to the early days of playing with hickory clubs or even decades later, when members of the Rat Pack, Bob Hope, Bing Crosby and other celebrities made the short trip from the Cal Neva Resort & Casino to risk tens of thousands on rounds at the storied nine-hole course. Originally called Tahoe Tavern Links, Tahoe City Golf course was designed and built in 1917 by female golfing legend Isabella May “Quennie” Dunn-Webb, and first opened for play in 1918. 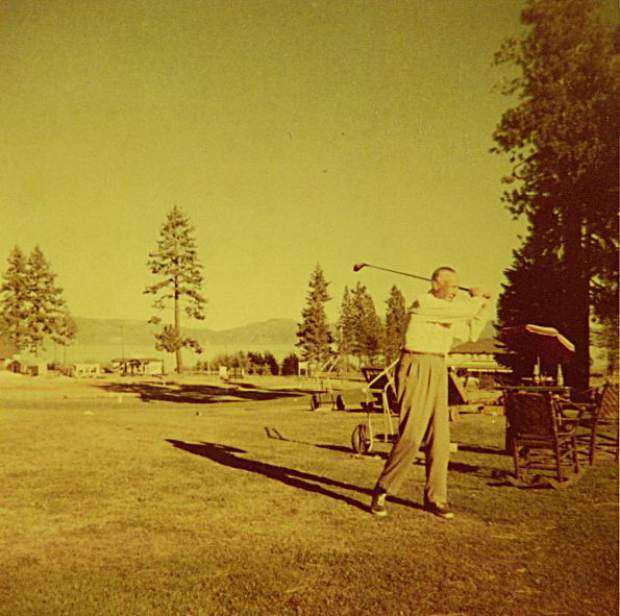 This weekend the Tahoe City Golf Course will pay homage to the course’s beginnings with rounds of golf for 50 cents. From today through Sunday, green fees will cost 50 cents, roughly the price to play a public course in 1918. A bit was worth roughly 12 cents, thus the course’s 50-cent weekend. Dunn-Webb’s course was the first to open in the Lake Tahoe area, and during a time of gender inequality, her contributions to the game standout as one of the more remarkable feats in golf history. Dunn-Webb also designed the Washoe Golf Course in Reno, and her brother John Duncan Dunn designed Old Brockway Golf Course. In clubhouses around the world the Dunn family is still talked about in regards to their contributions to the game. From the mid to-late 19th century, Dunn-Webb’s grandfather, Willie Dunn Sr., played professionally and was keeper of the green at England’s oldest golf course, Royal Blackheath Golf Club. Her father, Thomas Dunn, was a club maker and designed dozens of courses in his lifetime. In Tahoe City, the turn of the century brought with it a railroad spur line and guests to the Tahoe Tavern. As the tavern and the sport grew in popularity, a portion of the Tavern’s extensive holdings were set aside for a golf course. 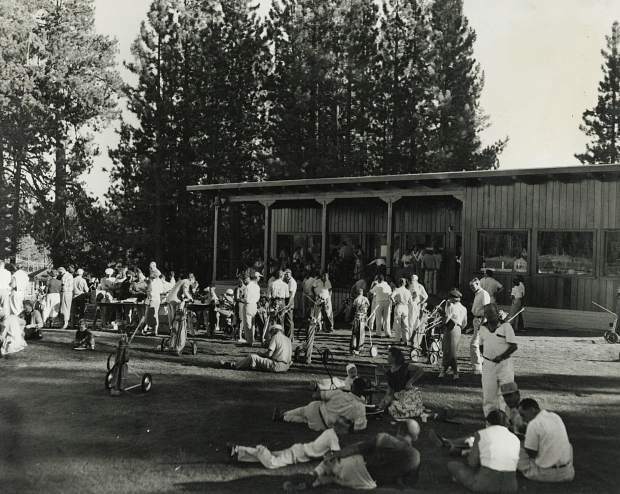 The Tahoe Tavern commissioned the course in 1917. A six-hole course with sand greens was constructed, and then expanded to nine holes and 2,765 yards in 1921. Decade’s later after going through several sales, the Tahoe Tavern was divvied up among the company’s partners. Through this process the course became the property of Gordon and Pat Hyde in 1946. Two years later, the Hyde’s sold to Carl Bechdolt Jr. and his wife Elsie. 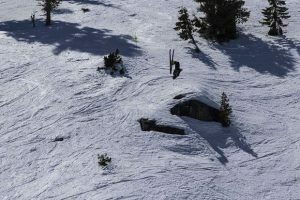 The course remained in the Bechdolt family until 2012, when the Tahoe City Public Utility District purchased it. The course changed throughout the years, moving hole locations and layouts as Tahoe City grew. The course players see today hasn’t changed since 1968, and is designed to play relatively easy with wide fairways and soft greens. Yet, over the last century the old trees, springs, and other water hazards around the nine holes of play have seemingly developed an uncanny ability to attract balls, making the nine-hole, par-33 course a challenge for most any golfer. From having a woman design the course at a time when females couldn’t vote, to allowing minorities to play when the country was in the middle of the Civil Rights Movement, the course has a long history of bucking golf and social norms. Bonino’s father had a two-decade run during the ‘50s and ‘70s as the course pro, working the grounds during some of Lake Tahoe’s most notorious days. Of all the players and celebrities his father saw and played with, Bonino said there was no one he spoke more highly of than Davis Jr.
“My dad said he was the most talented guy he ever met, could do everything — sing, dance, golf, he could do everything,” Bonino said. 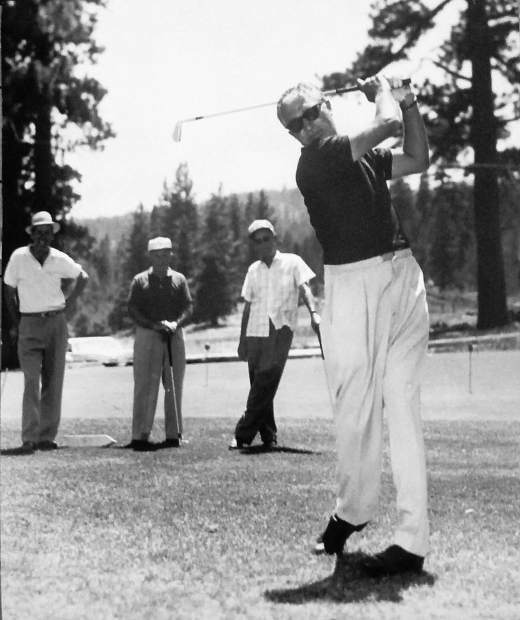 Tahoe City Golf Course has long stood apart from other courses. Through the years the small intimate course and its clubhouse has served as a place where rich and famous players could mingle with amateurs and junior golfers. Countrywide Financial Corp co-founder David Loeb learned to play at Tahoe City Golf Course, according to the clubhouse, and former United Airlines Chief Executive Richard Ferris also frequented the grounds. Many celebrities have shown up not to play, but to simply spend hangout in the clubhouse, enjoying a place that manages to be both prestigious and blue collar. Actor Robin Williams used to entertain staff and anyone else around him as he sat the bar waiting for his children to finish playing. Actor Milton French-Stewart would also come in just to eat “all the time,” Bonino said. In celebration of the course’s centennial, Tahoe City Golf Course is putting on events and specials throughout the golf season. Throughout the year, every Tuesday (excluding July 3) will be May Dunn Day. The course will offer a nine-hole ladies rate of $19.18, in honor of the course’s 1918 opening. Similarly, every Thursday (excluding July 5) will be Throwback Thursday with nine-hole pricing at $19.18 all day for all golfers. In addition to specials, the course will be the temporary home to a portion of golf historian Rick Lund’s extensive collection of historical golf equipment and memorabilia. The exhibit’s centerpiece will be a junior golf club made by and carrying the Dunn-Webb name. On Friday, June 8, the course will host putting and driving contests for all ages using hickory stick putters and throwback equipment. Following the contests, nationally published author and Tahoe historian, Mark McLaughlin, will deliver a historical presentation on the Tahoe City Golf Course. Admission is free and subject to space available. The following day the course will host the Two Bills Heritage Golf Tournament with proceeds benefiting the Red Cross and the Tahoe City Recreation Association. On Saturday, Aug. 19, in a nod to female-influenced beginnings, the greatest female golfer of this generation, Annika Sorenstam, will provide a junior golf clinic and demonstration followed by a question and answer and photo session. Following Sorenstam’s clinic, the course will host its inaugural family golf tournament encouraging generations to come together and form teams. The junior clinic with Sorenstam has been funded by the Tahoe City Recreation Association, whose mission is in part to aid and encourage the development of youth in the community. Tahoe City Golf Course is in tremendous shape coming into the 2018 season, according to Bonino, after work done to improve drainage on the course and a light winter. 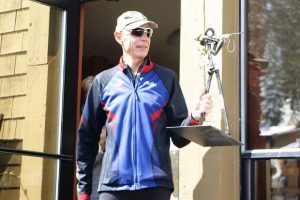 The course had a soft opening last weekend, according to Althof, kicking off a year’s worth of centennial celebrations. 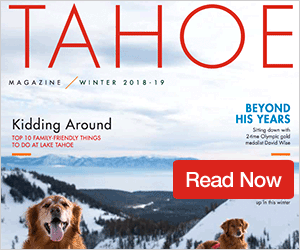 With the course entering its 101st year of play and under the ownership of the town’s utility district, the plan is for another 100 years of golf on Tahoe’s North Shore.